As a Colorado homeowner, you are likely looking to the spring season with a to-do list of improvements to enhance the enjoyment and value of your property. One project is DIY fencing, which may prove to be a rewarding and cost-effective task. A simple fence installation is much more involved than most people realize, though. Before you can break ground, there are numerous considerations to take care of to avoid any dangerous or illegal outcomes. As a trusted fence company in Larimer County, Rocky Mountain Fence & Decks is here to provide comprehensive quality to your Loveland or Fort Collins home. Our deck and fence contractors specialize in a wide range of exterior improvements, including outdoor living spaces, pergolas, and more. We’ll work with you to create a personalized plan that matches your vision while meeting your budget. We admire the DIY spirit, but our local fencing company is well aware of the challenges that can slow down and frustrate homeowners. Today, we’ll highlight a few vital steps necessary when completing your own fence installation. If you are looking for professional help with your residential fencing needs, be sure to reach out to Rocky Mountain Fence today! Before any work can be done, it is essential to seek out the rules and regulations of your neighborhood’s governing entity. Homeowners associations (HOAs) are infamous for for creating and enforcing rules and specific acceptances of certain areas of your home, such as its paint color or your fence materials. One thing about HOAs that many residents do not realize is that this entity often has the authority to seize your land if you do not abide by the rules. If you pay an HOA fee, it is necessary to check the governing regulations for your potential fence installation. Whereas some neighborhoods allow for a wide range of styles and applications, others may not approve of any fence! Regardless of your HOA status, you need to check with local building codes to ensure that your new fence is compliant to local ordinances. It is often an easy process to seek out guidance from local municipalities such as the Loveland Building Department. The representatives here will be up to date on the relevant rules and regulations concerning your new fence. While at this office, we highly recommend pulling a permit for your new project. The Loveland Building Division can provide guidance on when you need a construction permit, which includes decks, building additions, sheds over 200 square feet in size, and so on. It falls on you to obtain a permit for your renovation. If you fail to do so, financial fees and other reprimands may be possible until the conflict on your property is remedied. Even if a permit is not required, it is often highly recommended. This process includes acceptance of your proposed plans, which includes filling out a corresponding form that lists the details of your work and an estimated project cost. Completing renovations that are done per city code can provide a wide range of benefits for your home, including peace of mind and measurable increases in your property value. When it comes time to sell your place, renovations that were not done with governmental approval may result in complications. In some cases, the buyer’s bank may even refuse to finance the investment if your renovations are deemed unacceptable. Further problems can occur if somewhere were to be injured as a result of a defect in your home improvements. If the buyer of your property finds renovations that were undisclosed, they may be able to seek legal damages against you. Every situation is different, but the permit process is often very simple and affordable. Our residential fence contractors can also help here, taking care of this process to give you peace of mind. Breaking ground on your property can prove to be very hazardous if you do not call for utility locates first. Most homeowners can call 811 before digging to receive location services for their utility lines. Most electrical and gas utilities are buried a safe distance underground, but it’s important to call ahead just to be safe. You can also receive locates for different cable providers, and private services can also account for features such as sprinkler lines. Accidentally striking a gas pipe, water line, or live electrical wire can prove to be dangerous for many people. We fully endorse being safe and being sure you know what’s below before you start digging. 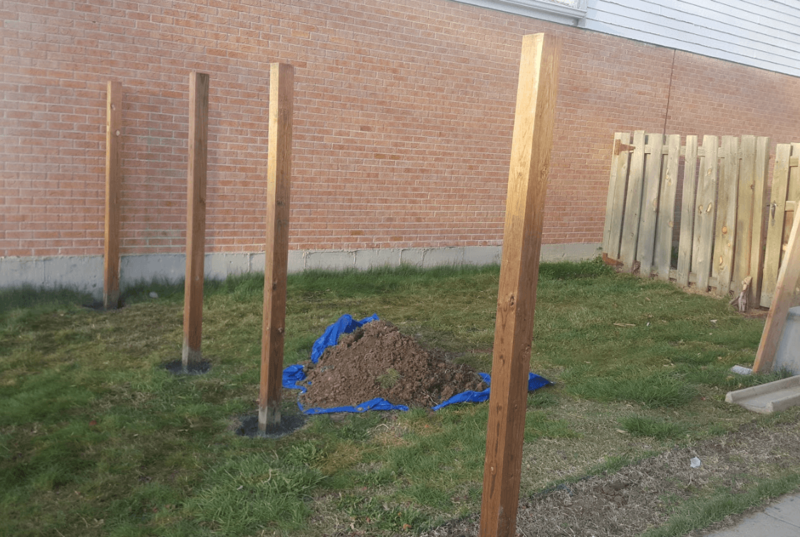 Fence posts need to be placed from a third to one-half of their depth in the ground for maximum stability, requiring you to dig deeper than two feet for many projects. Once you have created a plan according to local regulations, received a permit and subsequent inspection approval, and have your property marked for utilities, it’s time to get to work. Remember that this process is labor-intensive and will require the proper tools to ensure a quality outcome. 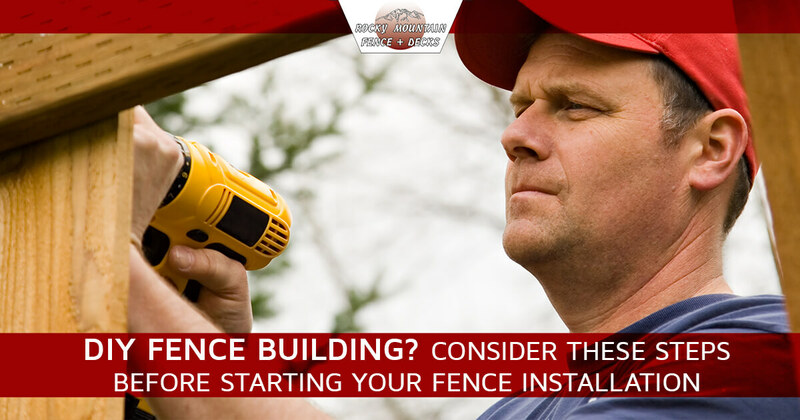 Minor mistakes can lead to costly remedies, sabotaging the purpose of doing your fence installation yourself. It’s important to plan properly and work within safety requirements established by local agencies. If this sounds like a lot of work, you may better benefit from hiring a local fence company for assistance. Rocky Mountain Fence & Decks has proudly served as your trusted fence company in Larimer County since 1992. Our reliable and professional deck and fence contractors are experienced enough to deliver a personalized outcome that is sure to meet your needs. Contact us today to see how we can surround your home with quality with our fencing services!